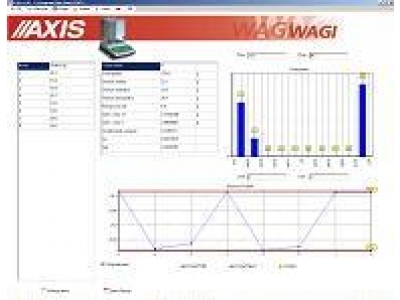 STAT software is designed for cooperation with AXIS balances, and is used for collecting measurement results and their statistical processing. It allows for operation in manual and automatic mode. It also allows for setting any time interval between the successive measurements, as well as for determining the number of measurements for collecting. The measurements number can be unlimited. The software has options of report and samples printing together with sampling time and date. It allows also for recording results in text file and loading previously recorded measurements. statistical calculations for weighing series: sum, minimum value, maximum value, average value, maximum and minimum difference, variance (n and n-1), variance coefficient, 10-bar histogram, samples charc according to sequence or time chart.